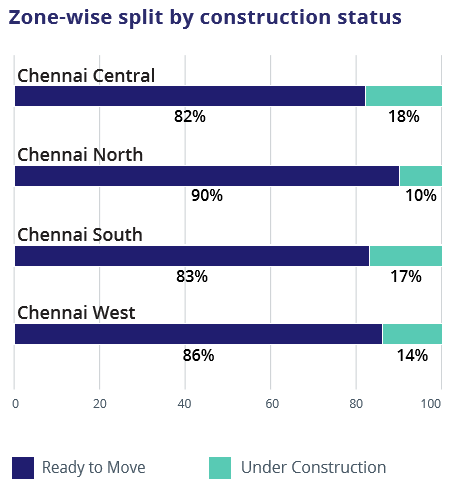 While North and Central Chennai displayed stability compared to the last quarter, South and West Chennai noted healthy housing demand backed by IT boom and improved infrastructure. Ashok Nagar and Chromepet in the South emerged as top grossers in Jul-Sep 2016 with six and five percent hike in average capital values, QoQ, respectively. Both the localities thrived due to the presence of cost-effective inventory. Anna Nagar garnered healthy traction from the business class due to ample availability of 3BHK and 4BHK units, resulting in four percent capital growth. 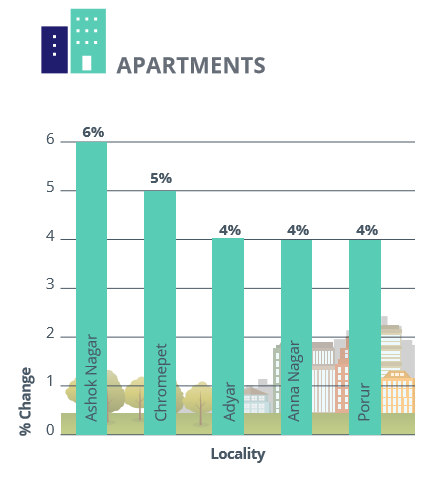 While limited inventory pushed up prices in Adyar, rapid industrialisation and increased housing demand from mid-income group hiked values in Porur. North Chennai received maximum enquiries for residential plots owing to availability of large tracts of developable land and slightly lower ticket size as compared to South and West Chennai. Avadi in the West topped the chart with 12 percent average capital growth in Jul-Sep 2016. Proximity to ORR and IT/ITeS clusters boosted land rates here from Rs 1,200 per sq ft to Rs 1,400 per sq ft. 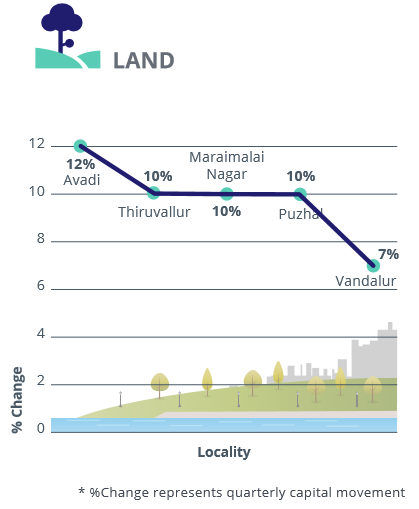 Among other key performers, Thiruvallur, Vandalur, Puzhal and Maraimalai Nagar witnessed traction on the back of strategic locations, relatively lower plot rates and proximity to employment hubs. 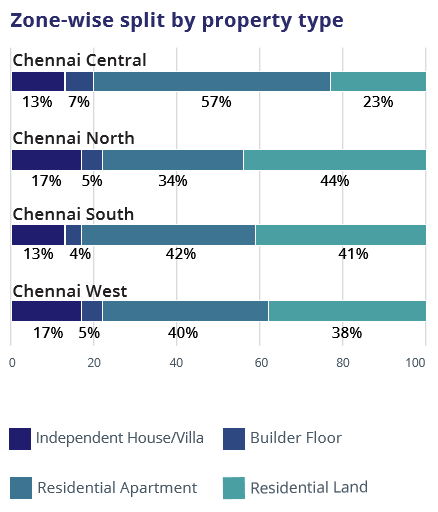 While average capital values of plotted developments in North and South Chennai displayed an uptick, those in West registered a fall by two percent. Chennai’s rental market reported negligible growth, YoY. Barring a few localities, average rental values across several markets sloped downwards. Availability of rental accommodations at affordable rates in proximity to office spaces towards the fringes of the city made the city-centre lose its sheen. 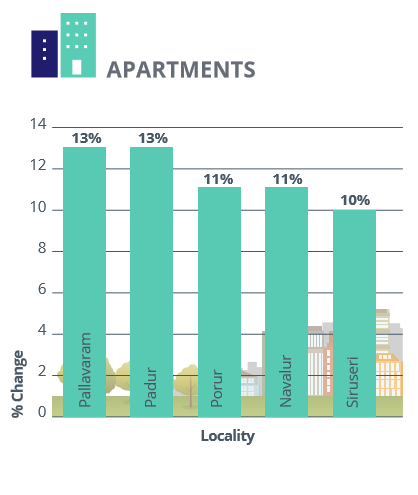 Pallavaram and Padur clocked 13 percent hike in the average rental values, YoY. While Pallavaram gained traction owing to smooth connectivity to OMR and airport, Padur was preferred for its proximity to IT hubs and educational institutions. Presence of office spaces, SEZs and good connectivity boosted leasing values in Porur, Navalur and Siruseri. Most of the tenants vying for residential occupancy comprised IT professionals and students. 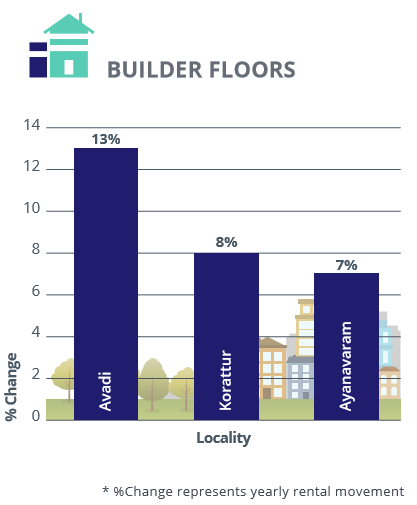 Increased popularity of builder floors among the student community and working professionals resulted in a modest rental growth for the property type, YoY. Avadi led the market with 13 percent annual rental appreciation. Nearness to premium markets like Ambattur and Anna Nagar, coupled with suburban rail connectivity pushed rental demand here. Presence of industrial hubs and manufacturing companies drove the rental values in Korattur, recording eight percent average growth, YoY. Rental values in Ayanavaram, Pammal and Perambur soared on the back of increased demand from railway staff members and limited availability of gated communities. 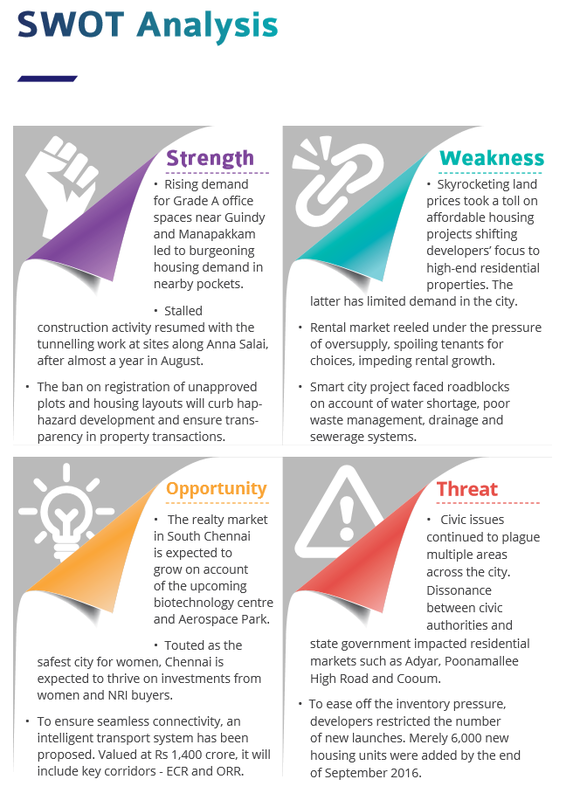 Factors such as reduction in the number of new launches, shrinking gap between demand and supply and new construction along peripheral locations are helping Chennai move out from the shadows of the past. Increased preference for gated communities led to a higher demand for residential apartments in Jul-Sep 2016 as against the previous quarter. 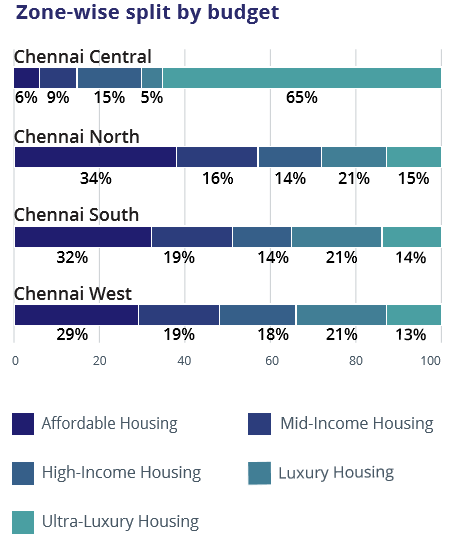 Micro-markets in South, West and Central Chennai reported maximum concentration of housing societies. Availability of large tracts of developable land was restricted to the outlying areas of Mahabalipuram, Chengalpet and Vandalur. Of the total land supply in the city, North Chennai grabbed the highest share with 44 percent inventory housed here. Popularity of builder floors rose marginally in Jul-Sep 2016 and stood at six percent, in comparison to four percent in Apr-Jun 2016. With most of the end-users fervent about budget properties, demand for affordable housing surpassed its supply in Jul-Sep 2016. GST and OMR belts and Sriperumbudur reported maximum availability of such properties priced within Rs 25 lakh. Barring affordable projects, supply graph across all price ranges either stagnated or pointed south. Reduced investor interest shifted developers’ focus to affordable housing segment. A lion’s share of the project launches were reported in this category. Across different zones, Central Chennai housed maximum consolidated supply of ultra-luxury apartments at 65 percent. Demand for such properties priced beyond Rs 1 crore was limited. In line with the previous quarter, 2BHK units continued to dominate buyers’ preference over other segments. Young working professionals drove maximum demand for such properties priced between Rs 25 lakh and Rs 40 lakh. Units configured as 3BHK were the second most popular amongst buyers, recording a slight increase in supply QoQ. Not surprisingly, 1BHK and 4BHK units were the least supplied and preferred categories across the city. 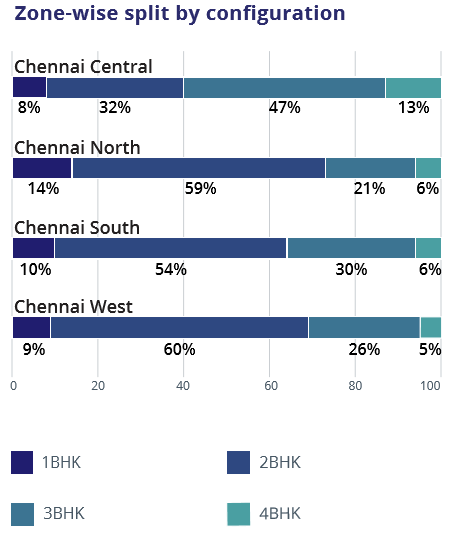 While North Chennai reported maximum supply of 1BHK configurations, Central Chennai housed the highest percentage of 4BHK units. As a handful of old projects got completed, supply of ready-tomove-in properties inched up minimally by a percent in Jul-Sep 2016 as against the previous quarter. Micro-markets in the North and West such as GST, OMR and Porur witnessed maximum supply of ready residential stock. 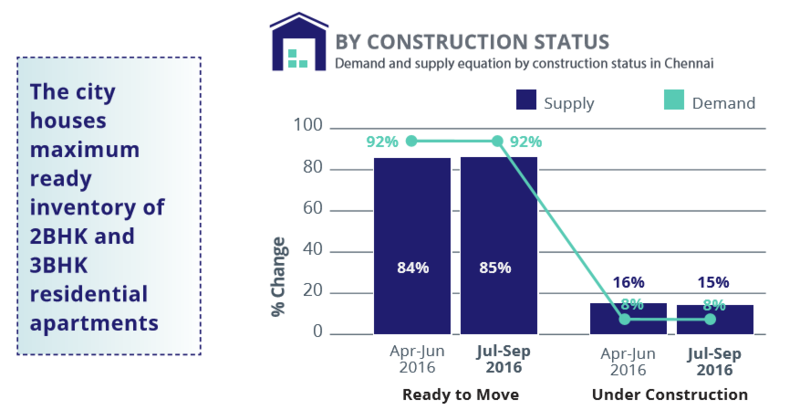 Against weak demand, supply of under-construction properties, too, registered a decline in Jul-Sep 2016. Fear of incessantly delayed possessions has shifted buyer’s interest towards ready-to-move-in properties, recording a colossal 92 percent share of the total demand.